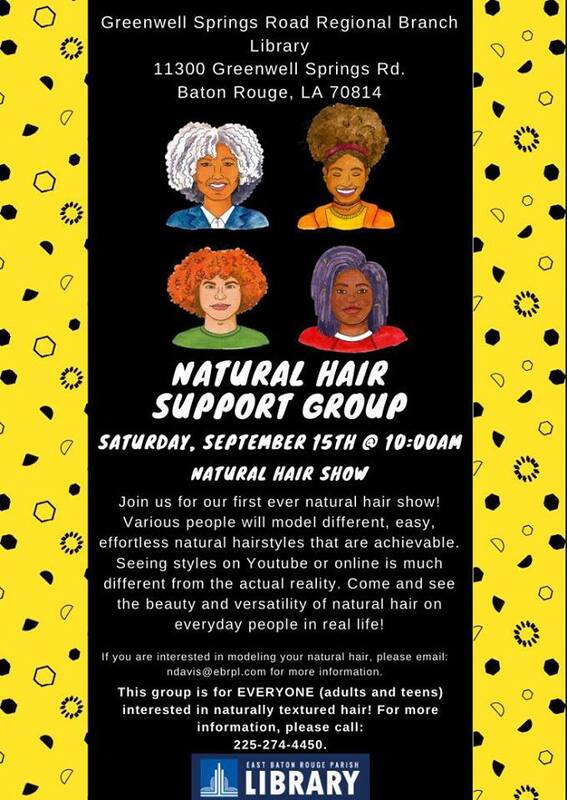 Natural Hair Support Group – first ever Hair Show! Do you have natural hair? Do you want to show it off to the world? Join the Greenwell Springs Road Regional Branch Library’s Natural Hair Support Group for their first-ever hair show! People will model all kinds of easy, beautiful natural hairstyles that you can totally master on yourself. The show starts Saturday, September 15th, at 10 AM. Interested in participating and modeling your own lovely locs? Contact Nicollette Davis at ndavis@ebrpl.com for more information!